Maximize your marketing efforts by using your show’s official logo on your website, social media, posters, programs, handbills, fliers and commercials. All of our logos are designed by professional artists, and, in many cases, they are the original designs used for the Broadway or Off-Broadway productions. Each Logo Pack includes logos in color and black & white, with multiple digital format files (JPG, TIFF, PNG and, in some cases, EPS). Logo Packs are available via digital download (not available on CD). Subplot Studio’s team of professional artists and marketers have created dynamic poster templates easily customizable with your organization name, show dates, times, credits and contact information. 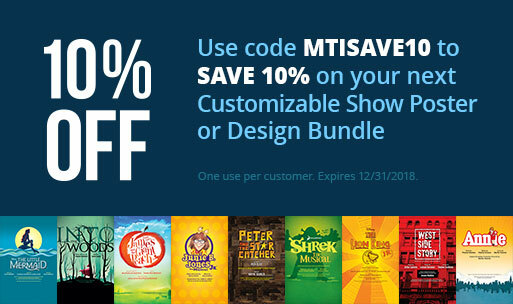 When you license a musical and purchase the show’s official Logo Pack from MTI, you can use it in conjunction with the superbly designed templates from our friends at Subplot Studio. Disney's Alice in Wonderland JR.
Chitty Chitty Bang Bang JR. Legally Blonde The Musical JR. The Pirates of Penzance JR.
Roald Dahl's Willy Wonka JR.
Can I get a digital logo pack? Logo Packs are available digitally. After you order your Logo Pack you will be sent a link where you or your designer can download download the files. The Logo Pack no longer comes on CD. Do all logo packs have Vector files? Not all of our shows have vector files available. Often, vector files are not possible from the original artist or agency, due to the nature and/or complexity of the art. We are working to make vector availability information available soon. Can I create my own logo? For most of our shows you may create your own logo. The only exceptions at this time are Billy Elliot The Musical, Green Day's American Idiot, and all Broadway JR. titles. Acccess to Logo materials for Honk Jr.
How do I get access to the logo pack that was licensed to us for the show Honk JR.
wondering if the logo is at least 300dpi? Can I get a hi res image fr Junie B Jones and Annie for our season brochure? Can I get a high res image for Junie B Jones and Annie for our season brochure? We have licensed to present RENT April 6-13. When you search RENT many logos appear and can we use that logo? Can we create our own logo? It says in your FAQ: For most of our shows you may create your own logo. The only exceptions at this time are Billy Elliot The Musical, Green Day's American Idiot, and all Broadway JR. titles. In these cases the logo is offered to you free of charge. I see where you can download the American Idiot logo, but where can you download the Broadway JR logos? If we cannot download color versions of the Broadway JR logos, can we create our own? How do I download a purchased Logo Pack? I was told to use a code but WHERE? This is urgent. Related shows or resources: Logo Pack, The Music Man JR.
AN I CREATE MY OWN LOGO? For most of our shows you may create your own logo. The only exceptions at this time are Billy Elliot The Musical, Green Day's American Idiot, and all Broadway JR. titles. In these cases the logo is offered to you free of charge. Hi There, as per above, we are putting on a production of The Music Man, Jr. I will be making the posters myself - is there an official logo I have to use? and if so, can you please send it to me?